Hiking in Glacier Bay National Park is a truly unique experience, and this secret hike to Point Gustavus is a breathtaking way to surround yourself in the magic of the area! 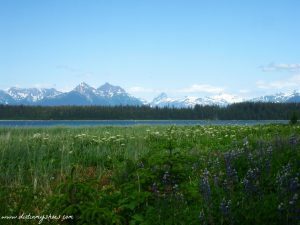 If you are planning a trip to Glacier Bay, be sure to check out my list of 10 things you can’t miss! I worked as a Park Ranger in Glacier Bay and it’s safe to say that the hike to Point Gustavus is no secret among the locals. Ask anyone and they could point you in the right direction. But that’s the thing about these secret hikes that I feature….you have to know what to ask for! As a tourist, there is a good chance that you would not find this hike simply because you didn’t ask the right questions. 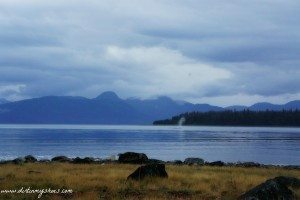 Point Gustavus is the entrance point of Glacier Bay National Park and sits just north of one of the most famous humpback whale-watching areas in the world. The “trail” is not really a trail, but rather an intense walk along a rocky beach. 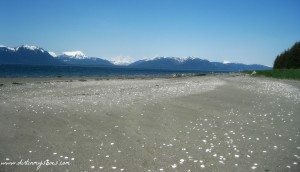 Eventually, a sandy beach emerges that opens out to Glacier Bay in one direction and the Icy Strait in the other, providing some of the most amazing ocean views you will ever see. This is the beautiful Point Gustavus! The area around Bartlett Cove is lush with wildflowers throughout a good part of the summer. Have your camera ready to snap the perfect picture. Be on the lookout for moose. I also saw a few bears along the way, so I definitely recommend reading up on these bear safety tips and carrying bear spray with you. Bear spray is sold at the Glacier Bay Lodge in Bartlett Cove, or you can check with the Visitor Information Station to see if anyone left a can behind for public use. You should always let someone know where you are going, especially for a long day-hike such as this one. If you do not have someone that you can share your itinerary with, check in and out with the Visitor Information Station. The rangers there are happy to write down your itinerary so that someone knows where you are in case of emergency! Getting to Point Gustavus is easiest to do at low tide. 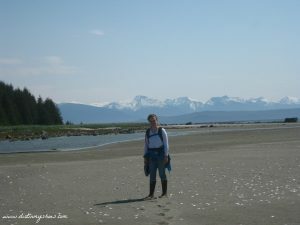 I highly recommend checking the tide tables and planning your hike around the low tide, making sure that you start hiking as the tide is going out so that you can end your hike while the tide is still low. 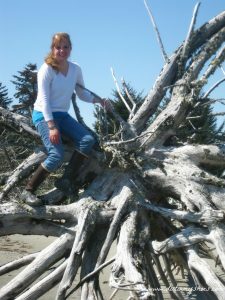 I was a stranger to the ocean tides when I first moved to the area (I’m a mountain girl!) so don’t be afraid to ask a ranger for help. You want to be hiking in the rocky section between the tree line and the water, as pictured below. Expect mountain and ocean views that stretch as far as the eye can see. For most of us, the landscape and environment in Glacier Bay will feel foreign. Be ready to step out of your comfort zone and enjoy the adventure, because it is one that you will remember forever! This hike is an interactive experience…plan time to explore your surroundings. I love spending time exploring the unique landscape and things I come across along the trail. 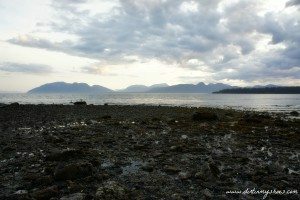 Incredible creatures live in the intertidal zone along the water, and it is fun to look for starfish and sea urchins. This giant piece of driftwood had washed up on the shore and looked like a beautiful sculpture on the sandy beach. Watching for whales is my favorite thing to do along the trail to Point Gustavus. If you are visiting during peak season (usually July), you can expect to see many whales right from the shore….I think I saw at least 20! 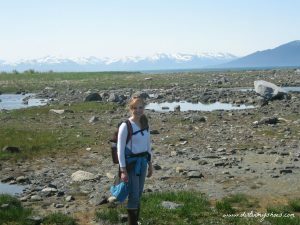 Here I am standing on the sandy beaches of Point Gustavus, speckled with beautiful white sea shells and stunning views of the Alaskan wilderness! The hike to Point Gustavus is 12 miles round trip out-and-back if starting and ending at Bartlett Cove. I strongly suggest taking this route. 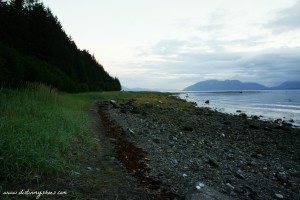 It is possible to continue on from Point Gustavus to reach the town of Gustavus (I have also hiked this route) and it becomes incredibly more difficult to navigate the mud and the tides. We ended up in very deep mud and even deeper water, then had to walk back to Bartlett Cove from town, making the total mileage closer to 20 miles round trip. I do not recommend this route, but if you are considering it, please let me know so that I can provide you with some additional advice! Watch the weather! Glacier Bay is unpredictable and hypothermia is a very real concern in this part of Alaska. Bring a jacket and don’t be afraid to turn around if the weather takes a turn. Choose your footwear wisely! 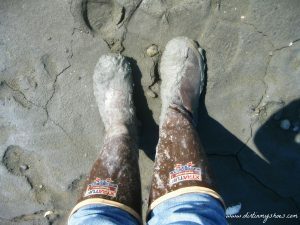 I wore the famous Southeast Alaskan shoe of choice, Xtratufs, which are a staple in any Gustavus resident’s wardrobe. They did great in the water and mud, but were severely lacking in the support my foot needed walking along the rocky shore for miles and miles. Instead, I would recommend a good hiking boot with ankle support and waterproofing (that you don’t mind getting a little dirty). The trail begins near the Bartlett Cove Visitor Information Station. As you walk out of the Visitor Information Station, take a left across the parking lot and take the trail toward the campground. Pass the campground and continue until the views open up into the main channel of Glacier Bay. From there, head south along the beach and walk along the main channel of the Bay for 6 miles. 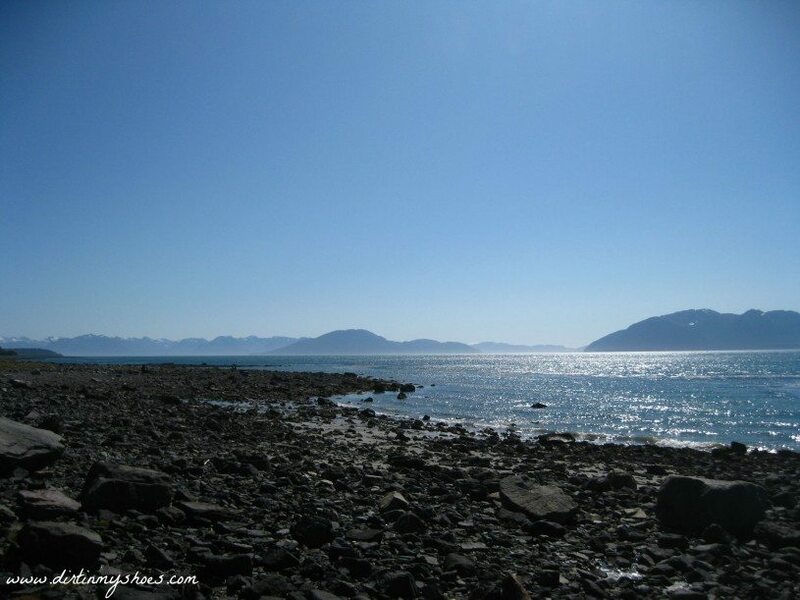 You have reached Point Gustavus when you reach a sandy beach and the main channel of Glacier Bay meets up with the ocean in front of you. 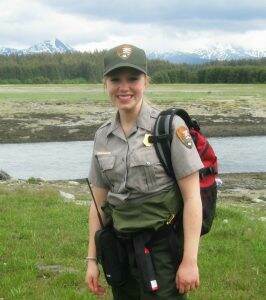 It is a good idea to stop at the Visitor Information Station before your hike to talk to a ranger. They can help orient you and tell you specific details about the hike to Point Gustavus, including the vital information you will need about the ocean tides. Have you been to Glacier Bay or are thinking about taking a trip? Let me know in the comments below!